Beloved husband, father, and Papa went home to be with the Lord on Saturday, October 8, 2016 at Covenant HealthCare – Cooper with his family by his side. He was 73 years old. 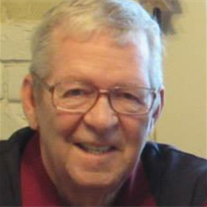 Timothy John McGillen was born on May 18, 1943 in Saginaw to the late Raymond P. and Mary K. (Corcoran) McGillen. Tim married his wife, Patricia, on May 10, 1968 in Saginaw; she survives him. He proudly served his country by enlisting into the United States Marine Corps, serving two tours in Vietnam. Tim was a current member of Holy Spirit Catholic Church and the Ancient Order of the Hibernians. He was also an avid and passionate golfer. Surviving are his beloved wife of 48 years, Patricia J. McGillen of Saginaw; two daughters and one son: Michelle (Steve) Reinig of New Lothrop, Molly A. (John) Barnes of Flushing, and Timothy J. McGillen, II of Punta Gorda, Florida; and five grandchildren: Shane (Libby) Gross, Kayla Gross, Spencer Gross, Lucas Reinig, and Shea Patrick McGillen; Also surviving is Cousin Fran as well as many nieces and nephews. He was preceded in death by a son-in-law, David Gross; one brother, Michael McGillen; and one sister, Maureen Miller. FUNERAL: A Funeral Liturgy will take place at 11:00 a.m. on Thursday, October 13, 2016 at Holy Spirit Catholic Church, 1035 N. River Rd. Rev. Ronald J. Dombrowski will officiate. Military Honors will be conducted under the auspices of the United States Marine Corps and American Legion Post #439. Honoring Tim’s wishes cremation will follow with burial at St. Michael Cemetery of Maple Grove. VISITATION: Friends are welcome to visit with the family on Wednesday, October 12, 2016 at the Deisler Funeral Home, 2233 Hemmeter Rd. (off State) from 1:00 p.m. to 8:00 p.m. A Vigil Service will be held at 7:00 p.m. Wednesday evening. Tim will lie in state at the church on Thursday from 10:00 a.m. until the time of Mass. MEMORIALS: In lieu of flowers, those planning an expression of sympathy may wish to consider memorials to the Wounded Warrior Project or the American Heart Association. Please feel free to share your thoughts and memories with the family at the funeral home, church or through www.deislerfuneralhome.com.